Dreaming of Dolls: Nana Nana Nana Nana BATMAN! This is another quilt that I made as a surprise for a friend, or in this case, friends. It is hard for me not to post this early and spoil the surprise! Mcooper and randomtraci have a blog together, Isn't She Dovely? As they live in different states, it isn't always easy to make blog posts that make it appear that their dolls are hanging out together. I decided to make them matching quilts. 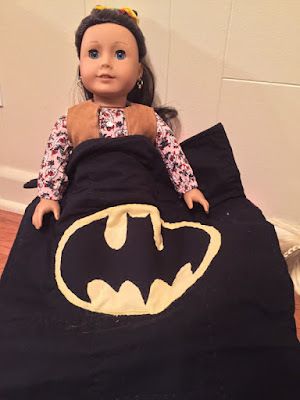 Having the dolls use, or seem to use, the same quilt in pictures can make it seem that they are in the same place, not hundreds of miles away. Both these ladies are doll fans and Batman fans. Sooooo it was pretty logical to decide to make matching Batman quilts. The logo is a little big for AG scale. My reasoning is that there are lots of comforters for kids with huge pictures of cartoon characters, or logos. I think it works. 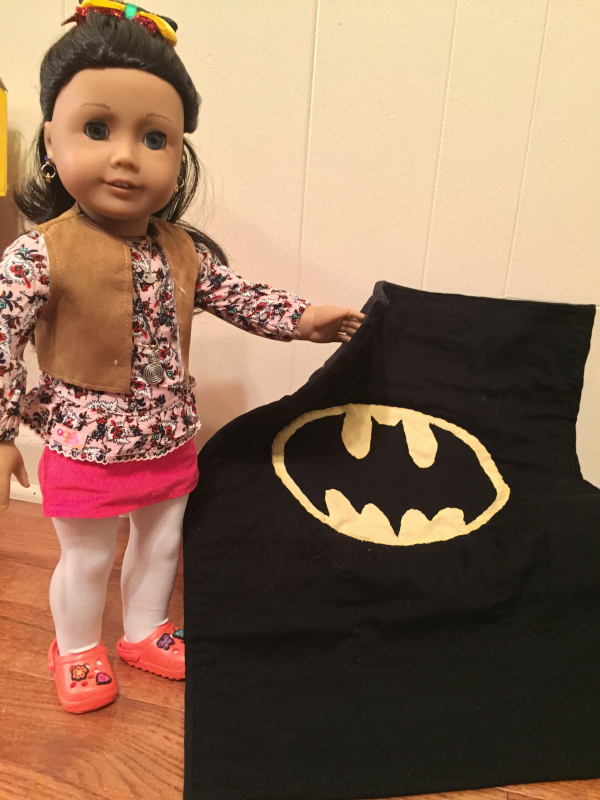 Besides, it was difficult cutting out that Batman symbol, and I'd hate to cut out an even smaller one. Anne volunteered to model, to show the scale. Besides, she wanted to "break it in" for Wrennie, Callie and their other friends. Here is Callie with the quilts! Yay, I love it when I can make people happy! They are so cool! I can't wait to get mine from Traci. Thank you again!